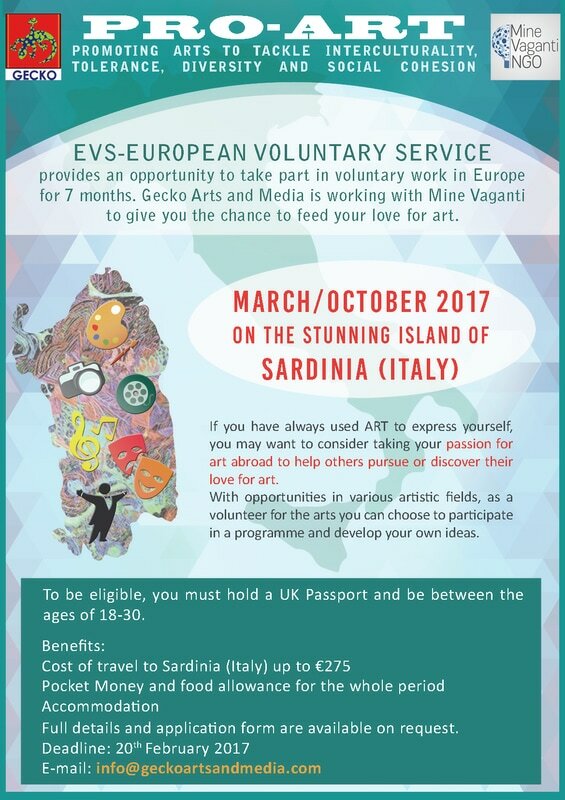 ​Gecko Arts and Media, in partnership with Mine Vaganti (Italy), is providing an opportunity for one individual to take part in a funded voluntary work placement in Sardinia, Italy as part of the EVS programme (European Voluntary Service). Whether you are looking to gain some work experience, put your artistic skills into practice, or simply experience a new culture, this is the voluntary project for you. If you have always used the arts to express yourself, you may want to consider taking your passion abroad to help others pursue or discover their love for art. With opportunities in various artistic fields, as a volunteer for the arts you can choose to participate in a programme and develop your own ideas. To be eligible, you must hold a UK Passport and be between the ages of 18-30. If you are interested in this opportunity, you can send your CV to us at info@geckoartsandmedia.com or call 01902837375 for more information.